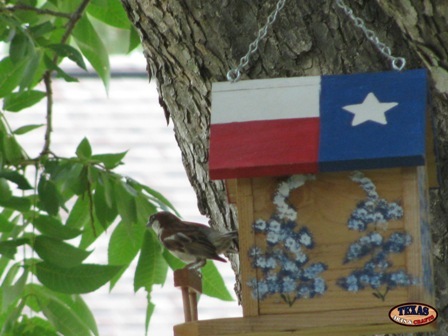 The birds listed below use non-specific bird houses. These backyard birds may not be picky about the kind of bird house they will build their nest in, but they may be picky about the location of the box. These birds may also be particular about their habitat, so if you are looking for a specific bird, be sure you have the right habitat. The American Kestrel likes areas such as farmland and meadows. The American Kestrel also likes a habitat that is a park or has orchards. The bird house should be placed at least ten feet up on a tree. The bird house can also be placed on a building if one so desires. The Great Crested Flycatcher likes a habitat that is near forests, or wooded areas. The Great Crested Flycatcher also likes parks and places that have orchards. The bird house needs to be hung at least six feet up. Wrens are probably the easiest to attract as they are not particular. Wrens like just about any kind of bird house they can squeeze into. You can hang the bird house at about five feet up. The bird house can be hung very near your house if you prefer. Wrens are probably one of the most sociable of birds. Chickadees, titmice, and nuthatches like wooded areas with orchards. They may also like being near a park or golf course. The nest box should be hung on a tree at least five feet up. Tree Swallows like a habitat near water such as lakes or rivers. The nest box should be placed on a dead tree at about five feet or higher. Woodpeckers like areas that are wooded. The nest box should be placed at least ten feet up in a tree. The nest box should have saw dust placed in the bottom of it.